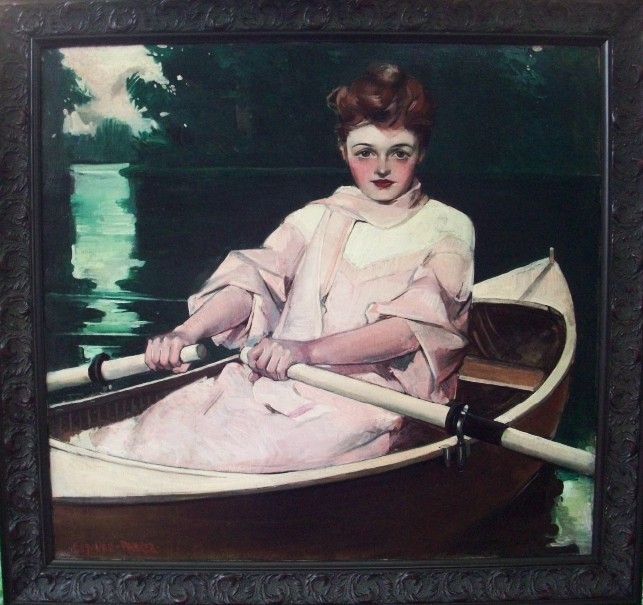 This is an oil on canvas painting of a pretty young woman in a boat, painted by Cushman Parker. This painting was created for the cover of the August 1906 Good Housekeeping Magazine. The artist captures the serenity of this early 1900's scene, as the young woman cruises across the water. This painting is a great example of how Cushman Parker could set the mood of the image in the scene that he set out to portray. Little is known concerning the life of Cushman Parker. He was born in 1881. The Saturday Evening Post commissioned Parker to create covers for the September 9, 1916, October 18, 1919, and May 18, 1935 issues. All three covers show great images of young children. He created 18 cover illustrations for Good Housekeeping Magazine between August 1905 and September 1910. Most of these cover images were either a smartly dressed pretty woman (the same model in some cases) or young children. In 1909, Parker created a paper doll line known as "Little Louise", which also appeared in Good Housekeeping Magazine. Between 1909-1915, he created another series of paper dolls, called "Dorothy Dimple and Her Friends". The dolls in this series represented a specific country, each wearing paper clothing representing that country. Parker also created advertising images for Bon Ami Cleaning Powder, Welch's Grape Juice, as well as ads for Beech Nut products, notably Beech Nut Peanutbutter, used during the 'teens and twenties. Cushman Parker passed away in 1940.